Houses & Homes VA: Kentucky man shoots down drone and has charges dismissed! Kentucky man shoots down drone and has charges dismissed! 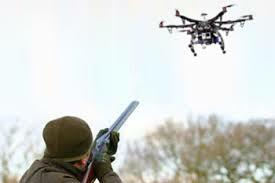 William Merideth decided that a drone flying over his property had no right to be there and took a rather decisive and aggressive action, he shot it down! Although the police arrested him for firing a weapon within city limits trial judge Rebecca Ward dismissed all charges against Mr. Merideth and he left court a free man. Mr. Merideth stated that he felt the drone was spying on his family and was flying below the tree line but the owner/operator of the drone said this was not true. According to Judge Ward however there were two additional witnesses that agreed with Mr. Merideth’s testimony and in her words, “He had a right to shoot at this drone, and I’m going to dismiss this charge”. Legally speaking, I find this to be a very interesting situation. Although Kentucky law clearly states that it’s a crime to “intentionally or wantonly deface, destroy or damage any property” “having no right to do so or any reasonable ground to believe that he has such right.” What about when the property in question is being used in an illegal manner such as to trespass on private property or to invade one’s privacy? Just as confusing is the right to defend one’s self. In most cities within the U.S. it is illegal to discharge a weapon within city limits but when a person is legally defending their self against an armed assailant they are not charged with this offense, right? So what about defending one’s self against a “spying” drone? While Title 18 of the United States Code Chapter 32 states quite clearly that it is a crime to willingly destroy any aircraft (punishable by up to 20 years in prison) is a drone an actual aircraft? The law is not quite clear on these matters but I would personally consider aircraft as having been designed to carry people or cargo and requiring a pilot on board as well. This case brings to light a lot of interesting questions and I suspect we will see more of this in the future. So what exactly is your right to privacy in today’s world? While I agree that one has the right to privacy on their own property what if a drone is being used to photograph land for sale that is surrounded by other land? Should the operator be required to obtain permission to fly over the property of others in order to reach its destination? Should the drone be required to maintain a minimal altitude while flying over private property? Even if all of these stipulations must be met in the future what prevents a drone from spying on you from a neighboring property that is does have permission to photograph? It’s difficult to predict the future use of technology but almost impossible to legislate morality and respect for others. Creating a law is one thing but enforcing it is quite another. With such technology in our skies I just don’t see how it possible to prevent its misuse. With high powered camera lenses and digitally controlled zoom even a drone very far away from you could be watching your every move and you would never know it. How do you charge someone with a crime that you aren’t even aware of?